Yesterday, as I pumped gas in my car, I looked down the road a little and saw a place that makes grave stones. There was an older couple outside looking through the examples the company has. It’s just after Thanksgiving and close to Christmas, and this is what they were doing. Picking out a grave stone. The thought came to me about how short this life really is. We lost my Grand daddy two days before Christmas in 1992. We buried him on Christmas Eve. It has always cast a shadow over my holiday since. He was a fun person to be around. I was 18 when he passed, so my children never got to know him. If you are a Christ follower, when you pass away, your soul goes to Heaven right away. To be absent from the body is to be present with the Lord if you are a Christ follower. That’s GOOD NEWS! I have heard many stories of people who were with their loved ones as they passed and they talked about seeing heaven, angels, or their people who were already gone. Pray for someone today that is missing a loved one. Maybe they just lost this loved one during this holiday time. Pray harder for them to get through it. Our God is gracious and He has promised to comfort those who mourn. 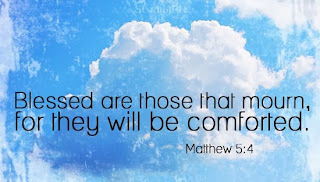 (Matthew 5:4) He always keeps His promises! ← Is God really there?